This week I had the opportunity to a color challenge. I had to use Yellow, Green, and Blue. My main image couldn't be a card. But as you will see, I snuck a mini card in to go along with my gift bag for a friend who hasn't been feeling well. 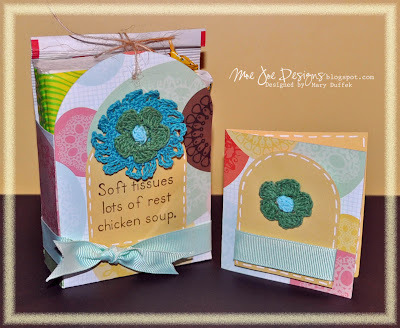 I made this gift set using the SVG Favor Bag file from the Blackleaf Studio's website. I was able to purchase Sure Cuts a Lot at an extremely great price and that allowed me to use my Cricket Expression to cut the awesome Blackleaf Studio favor bag. Let's just take a look at the math real quick. You get an amazing 4 bags for $4.00. That is only a $1.00 a bag. Now when I buy treat bags for my children's parties, or an event I may need them for, it costs me a small fortune to purchase premade favor bags that aren't even as cute as these bags. $4.00 investment now and you save lots of money during the year on favor bags. And if you ladies are anything like me, we all know that we have stacks and stacks of paper that we haven't used yet, because it's just to pretty to use. And just imagine giving these little favor bags filled with candy to cheer up a friend. It's a great package and it truly only take a few minutes to make. As you can see you don't have to use them only as favor bags. I have mine filled with a few things to help a special someone feel a little better. Isn't it adorable? The picture above shows the inside of the card. It says "You are on my mind and in my prayers." I love that I can use stamps from my collection to enhance the digital projects. Here is the contents of my favor bag. 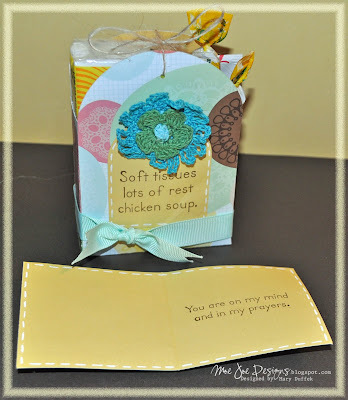 The outside of the bag says "Soft tissues, lots of rest, chicken soup. 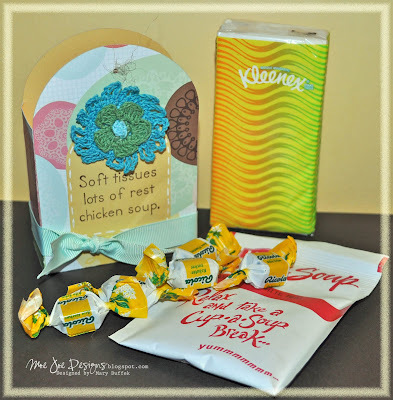 So I added a package of tissue, a package of Cup a Soup and some soothing cough drops. The mini card is a 3x3 size and it fits perfectly into the favor bag or I can attach the mini card like a tag and fill it with some words of encouragement to lift her spirits. 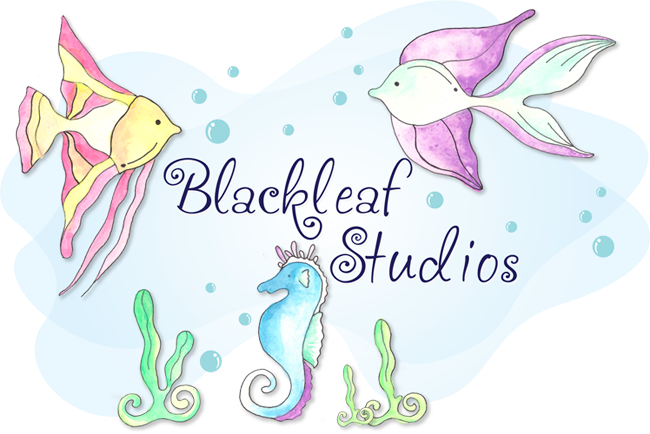 I can't wait to make more fun and interesting gifts using the Favor Bag from Blackleaf Studios. They also come in a .jpg format so if you don't have an electric die cutting machine you are able to cut them out by hand. Thanks for stopping by and I hope you were inspired to create a special little gift for someone you know using the Favor Bag file. I want to make some little purses for my nieces and fill them with fun girlie things, like a little mirror, chap stick and nail file. The possibilities are endless. I could also make them with some boy papers and fill them with candy, toys and other trinkets that boys love....hmmmm and we have a Lady's Retreat coming up with our church and we normally purchase bags to fill with homemade goodies that a few lady's put together and I could whip out 40 bags in no time.... Ok, Ok, I'll stop! Below are product details that I used to enhance the digital file. Deets: Digital File: Blackleaf Studios - SVG Favor Bag, Stamp: Get Well set from Cornish Heritage Farms, Paper: American Crafts - Dear Lizzy collection, Accessories: Crochet flowers - AC Dear Lizzy collection, white gel pen and ribbon from Paper Trey Ink. What a fabulous way to use the favour bags. Adorable!